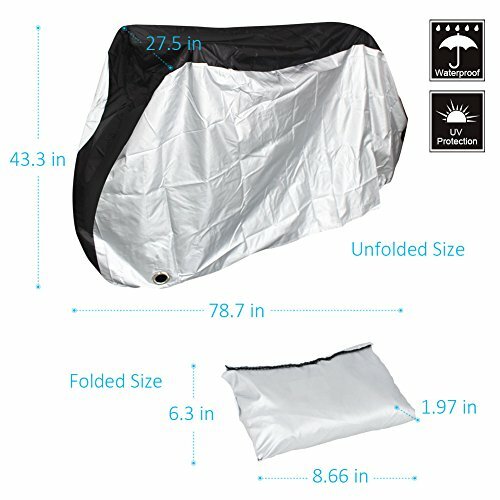 This Puroma bicycle cover offers a waterproof option to keep your bike in shape indoor or outdoor. 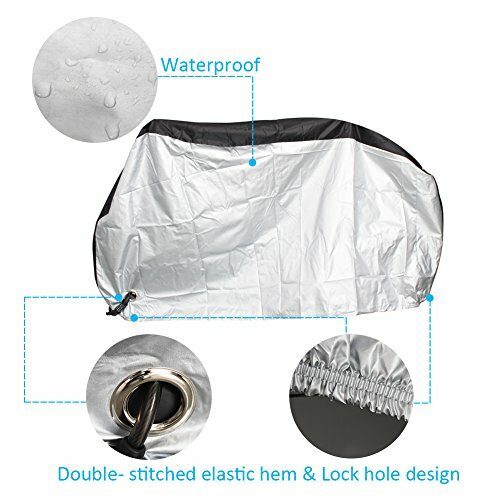 Protect your bike from sun, rain, dust, sunshine and scratches. Features elastic hem and buckle so the cover stays on during high winds. With the extra large dimensions about 78. 7″ x 27. 5″ x 43. 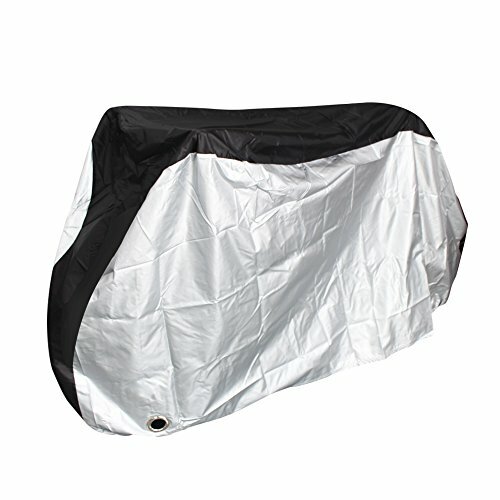 3″ (L*W*H) to ensure the cover will fit practically any mountain bike, electric bike and city bike up to 29″ wheel size. It even fits scooters and certain motorbikes. Specifications: Material: 190T Polyester Color: Silver & Black Dimension: 200 x 70 x 110cm/78. 7″ x 27. 5″ x 43. 3″ (L*W*H) Size Type: XL, which fit 1. 8m bike (29 Inch) Weight: 323g (11. 4 oz) Note: Please MEASURE YOUR BIKE before purchase. 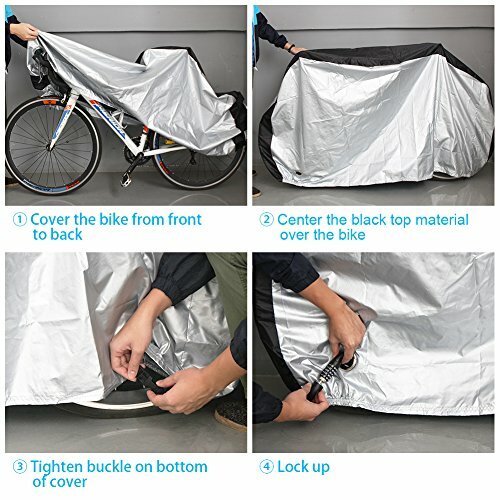 Installation: 1 Cover the bike from front to its back 2 Center the silver top material over the bikes 3 Tighten buckle on bottom of cover 4 Lock up Package Content: 1 x Silver & Black Bike Cover, 1 x Storage BagSuperior material coating: Waterproof polyester with PU and UV coating, protects bicycles from weather, dust, dirt and sun damage. Ultraviolet-proof up to 50+. 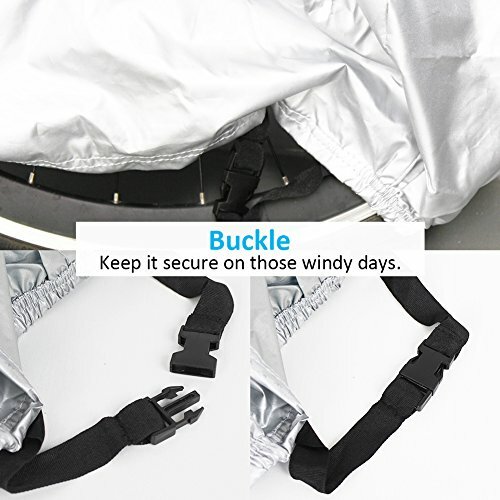 More secure & practical design: Bottom double- stitched elastic hem and special designed buckle for a snug fit, keep it secure on those windy days. Lock-hole special design: With Lock hole design at the front wheels area, allows using a bike lock with the cover on. 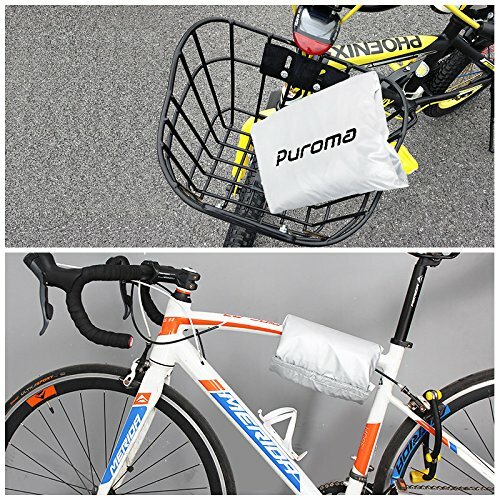 Convenient to carry: Compact size with velcro design that can be tighten on the bike frame or placed inside the basket neatly. 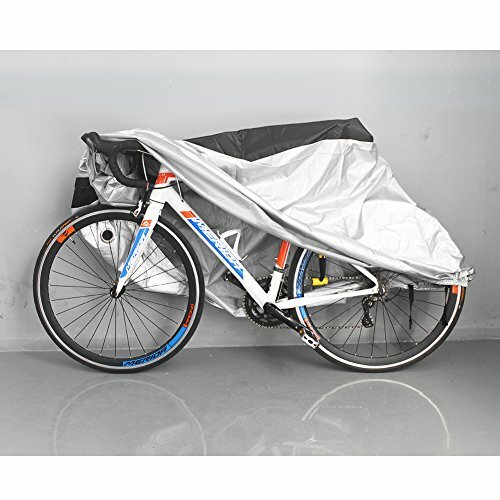 Large Size: Dimensions: 78.7 x 43.3 x 27.5 inch, well-suited for most bike up to 29″ wheel size.